The 2018 Farley Moody Galbraith Endowed Exhibition features the work of internationally recognized artist Robert Kushner. Kushner will give a gallery talk about his work on Wednesday, February 7 at 6 pm in the Sarah Moody Gallery of Art, 103 Garland Hall on UA campus. A reception will be held Thursday, February 8, from 5 to 7 p.m. in the gallery. Kushner (b. 1949) is an American painter known as a founder of the Pattern and Decoration art movement of the 1970s and 1980s. Kushner’s work combines organic representational elements with abstracted geometric forms in a way that is both decorative and modernist. 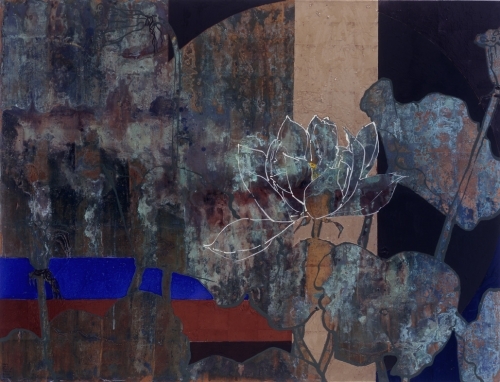 Since the 1980s, he has used a full spectrum of color with gold, silver and patinated copper leaf to render the flowers and leaves, which have become his signature motif. “I never get tired of pursuing new ideas in the realm of ornamentation. Decoration, an abjectly pejorative dismissal for many, is a very big, somewhat defiant declaration for me,” he says. 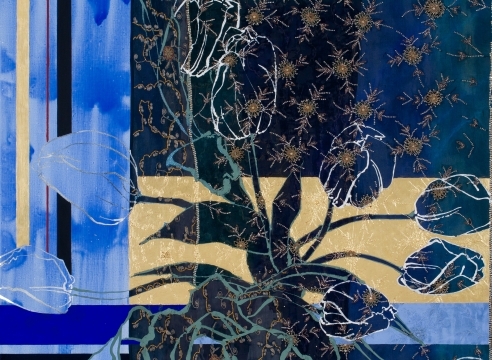 Kushner draws from multiple influences, including Islamic and European textiles, Henri Matisse, Georgia O’Keeffe, Charles Demuth, Ito Jakuchu, Qi Baishi and Wu Changshuo. His work has been included in the Whitney Biennial and Venice Biennale and is in prominent public collections including Museum of Modern Art; Metropolitan Museum of Art; Whitney Museum of American Art; National Gallery of Art; Corcoran Gallery of Art; Tate Gallery, London; San Francisco Museum of Modern Art; Honolulu Museum of Art Spalding House; Denver Art Museum; Uffizi Gallery; J. Paul Getty Trust; Ludwig Museum in St. Petersburg, Russia; and Philadelphia Museum of Art. Public commissions include sites in New York City, Tokyo, California and Washington, DC, as well as an 80-foot marble mosaic in the new Raleigh-Durham International Airport.